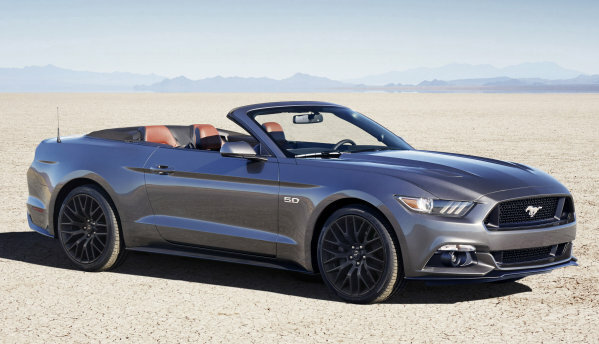 The 2016 Ford Mustang has gotten a spread of appearance packages for the new model year, but performance upgrades haven’t been forgotten – as the Mustang GT Convertible now has an optional Performance Package that prepares the droptop pony car for extended track time and improved lap times. When the 2015 Ford Mustang introduced us to the next generation of the fabled pony car, the addition of the EcoBoost package between the base V6 and the V8-powered Mustang GT led to a great many options for buyers, so Ford limited the number of trimline specific option packages and those packages with a lower take rate. However, with the 2016 model year quickly approaching, Ford is rolling out all sorts of appearance and performance upgrades to keep the lineup fresh. We have already talked about how the GT California Special is making its return in 2016 along with the arrival of the Mustang GT Black Accent Package and the Mustang EcoBoost Pony Package, but for those prospective Mustang buyers who are only interested in performance – today’s 2016 Mustang news is the most interesting. After only being available with the fastback models in 2015, the Performance Package will be available on the 2016 Ford Mustang GT Convertible when the car is equipped with the 6-speed manual transmission. If you buy a 2016 Ford Mustang GT Convertible and you like taking your car to the road course – or if you just want to have lots of go-fast goodies on your daily driver – the Performance Package is the answer. First, to improve the handling capabilities of the 2016 Mustang GT Convertible, the Performance Package features unique chassis and suspension tuning, including a strut tower brace, a K-brace, a larger rear sway bar and heavy duty front springs. Helping to get the droptop Mustang stopped from high speed is a Brembo 6-piston front brake setup that is tucked under 19 inch wheels all around (9” wide front, 9.5” wide rear) wrapped in high performance summer tires. Next, to help put the power of the 5.0L V8 to the ground more effectively, the Performance Package adds a Torsen limited slip differential with a 3.73 axle ratio while an enlarged radiator keeps the engine cool during extended sessions on the track. To make the most of these upgrades, the Mustang’s stability control, ABS and electronic power steering systems have all been tuned to yield better performance with the chassis and suspension goodies. Finally, the Performance Package deletes the standard rear wing of the 2016 Mustang GT Convertible and adds an aggressive front splitter, both of which help to improve high speed aerodynamics. On the inside, the Performance package adds a unique trimmed gauge cluster with auxiliary gauges. The Performance Package for the 2015 Mustang GT Fastback costs $2,495 and it looks like the two packages include all of the same features, so the price for the 2016 Mustang GT Convertible should be similar to that of the same package for the 2015 hardtop models. For $2,500 – it’s a steal. Okay, maybe Ford can change my mind a little ! I said NO new style as we felt it was nothing more than a corporate move to make a 2-Door Fusion ! With that said ; I like the Car as pictured & equipped with P.P. , of course they'd have to bend it my way with Automatic & 3.55 rear axle !! looking for 2016 ford mustang Conv. !